Screening tests can tell you whether your baby has a higher chance of a problem, but they cannot tell you for certain or give you a definite diagnosis of a condition. Results are usually reported as a statistical chance – a higher chance or lower chance of the baby having a chromosomal condition. They are not 100% accurate therefore, sometimes the results of a screening test can make a family worried when their baby does not have a condition. The opposite is also true and sometimes the tests indicate that there is a low risk, when a baby does have a condition. The efficacy of screening tests varies depending on which type of test you have, so it is important to read the information for the SPECIFIC test you are having. • Some abnormalities may also be detected at this scan such as neural tube defects, for example spina bifida. This is normally done at the same time as the Dating Scan, between 10- 14 weeks of pregnancy. A measurement of a small fluid collection within the skin at the back of the baby's neck (nuchal translucency) can help identify the chance of Trisomy 13, Trisomy 18 or Trisomy 21. Obtaining a nuchal translucency measurement depends on the position of the baby and is not always possible. If this is the case, you will be offered a different blood screening test, called the Quadruple test, when you're 14 to 20 weeks pregnant. The Nuchal translucency scan results are combined with a blood test result to give a more accurate calculation but these tests cannot give a definite diagnosis. If the risk is more than 1 in 150, further tests for chromosomal conditions will be offered. If the measurement of the fluid is the same or greater than 3.5mm, women will be advised that this may be an indicator of cardiac or other problems and a referral to fetal medicine specialists will be offered. If it wasn't possible to obtain a nuchal translucency measurement, or you are more than 14 weeks pregnant, you will be offered a test called the quadruple blood screening test between 14 and 20 weeks of pregnancy. This only screens for Trisomy 21 (Down's syndrome) and is not quite as accurate as the combined test. NIPT is a much more accurate screening test than the combined or quadruple tests, but again it cannot tell you for certain if the baby has a chromosomal condition. It is a simple blood test and is completely safe for you and your baby. You can have NIPT up to 21 weeks of pregnancy. If you have a higher chance result from NIPT you will be offered a diagnostic test to confirm whether your baby has a chromosomal condition or not. NIPT is currently available on the NHS in Wales and is being introduced on the NHS in England shortly. It is not yet available on the NHS in Scotland and is not available in Northern Ireland. It is available privately across the UK. This detailed ultrasound scan, sometimes called the mid-pregnancy or 20-week scan, is usually carried out when you're between 18 and 21 weeks pregnant. In some places, it may be carried out later than 21 weeks. Identify serious abnormalities when choices can be made whether to continue or terminate a pregnancy. Ultrasound scanning cannot diagnose a chromosome abnormality but can look for significant defects in organs like the heart and brain and also for 'chromosomal markers'. These markers, or 'clue signs' can be seen in normal babies, but are more common in babies with a chromosome condition. Abnormalities seen on scan, or a cluster of chromosomal markers may alert medical staff to suspect a chromosome defect, but this can only be confirmed by a diagnostic test such as CVS or Amniocentesis. 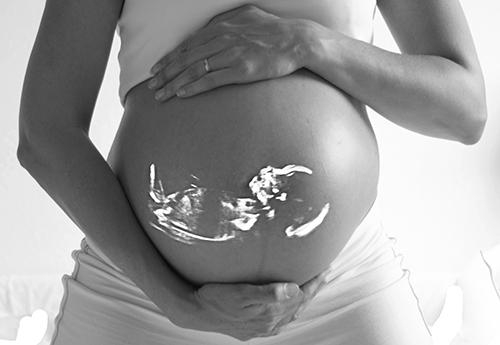 It is important to be aware that not all abnormalities can be seen on an ultrasound scan. Just because nothing is picked up on the scan does not mean that your baby will have no problems or anomalies. There are things that the ultrasound scan cannot pick up.